Among leaders, humor is a highly desirable trait, but is a frequently overlooked strategy. Research shows that humor can build teams, strengthen relationships, decrease stress, foster creativity, improve leader likeability, and can provide a competitive business edge. “Lead with Levity” provides leaders at every level with the skills to harness humor so that you—and those you lead—can build resilience, enhance communication, and boost engagement. Discover how to utilize humor even if you’re not funny; how to use humor to inspire and motivate; how humor can enhance creativity; and how to keep humor from blowing-up in your face! When humor occurs by chance it’s entertainment. But when you use humor by choice—you get results. Karyn Buxman is an international speaker, successful author, and neurohumorist (living at the intersection of humor and the brain). A pioneer in her field, Karyn shows leaders, and those they serve, how to build resilience, enhance communication, and boost engagement. From the Mayo Clinic to the Million Dollar Round Table, companies hire Karyn to educate, inspire, and entertain their audiences again and again. If writing burned calories, Karyn would be a Size 2! She’s written for numerous peer-reviewed journals such as AJN, AACN, and Journal of Psychosocial Nursing; and she’s the author of eight books. The media loves Karyn Buxman. She’s appeared in magazines such as Shape, Marie Claire, and Investor’s Business Daily and she’s a frequent radio and television guest. Karyn is one of 175 professionals (and one of only 39 women) in the world to be inducted into the National Speaker’s Association’s Speaker Hall of Fame. Wowing audiences with her high content and high energy—Karyn Buxman is serious about humor. Lead with Levity is a true diamond because it sparkles! Although it’s size might be tiny, don’t be fooled – the content is very impressive. Whether you’re a leader, motivational speaker or plan on being one, then you’ll definitely want to have this book handy. 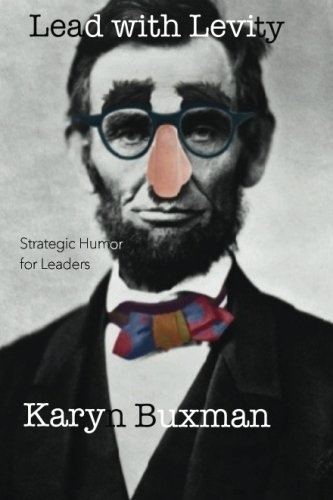 Humor works in business and Karyn Buxman really knows this topic inside and out.